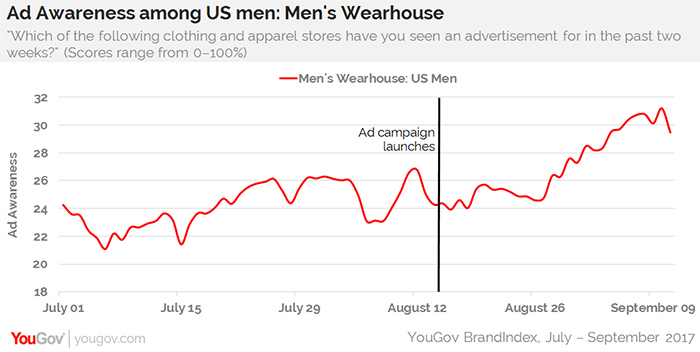 Men’s Wearhouse’s first ad campaign from agency EP+Co not only brought the retailer to its highest ad awareness levels of the year with men, but the metrics show it may help the bottom line too, according to YouGov BrandIndex. "The Tailor" campaign, which focuses on the in-house tailors and stylists who work to make each outfit fit men perfectly, elevated Men’s Wearhouse’s Ad Awareness from 24% of men recalling seeing an ad from the retailer in mid-August to a peak of 31% on September 10. 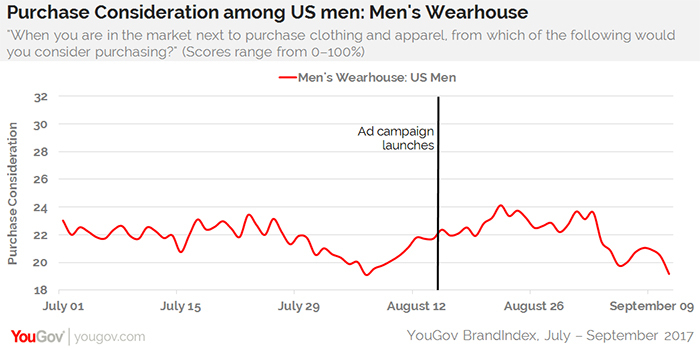 The campaign seems to have helped nudge Men’s Wearhouse’s Purchase Consideration score up a couple of percentage points during the second half of August. Over that time frame, the percentage of adult men considering buying from the brand the next time they were in market for clothes rose from 22% to 24%. Right after September 2, however, that percentage dropped to 19%. Purchase Consideration is YouGov BrandIndex’s key indicator of potential sales revenue.